Collector Paul sent me photos and information about his amazing and rare souvenir-building replica of the Carcassonne castle, photo above. The base is 10" x 4-1/2"; the building itself is roughly 8" tall to the tower tip. That's also the scale of the one in the book, Monumental Miniatures #314. The top is hinged and opens to reveal compartments within the towers. 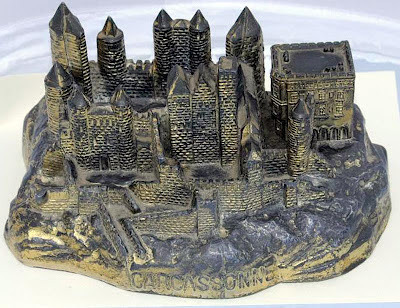 The plaque on base has, "Carcassonne Porte Narbonnaise." Paul bought the unusual replica a few years ago when it showed up in the Pacific at the now defunct Tacoma Dome antique show. 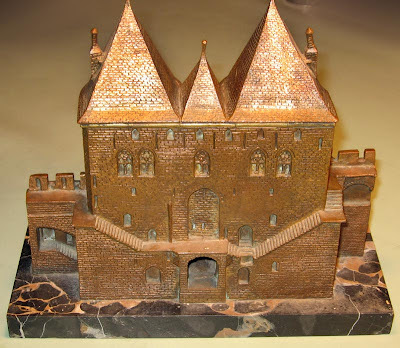 Building Collector Steve also has large Carcassonne castle replica in his collection. This one has a double inkwell in the marble base and shows a drawbridge in the front. Both of these may represent different tower gates of the fortified city wall. See photos below. 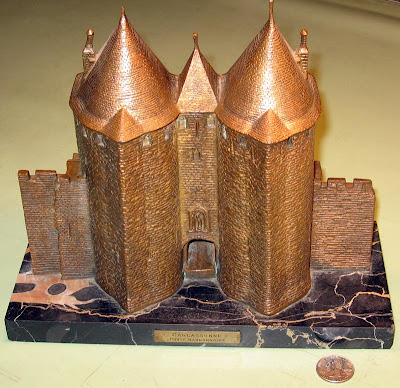 Yet another souvenir version of this castle measures 7 inches wide and stands 3 1/2 inches tall. The front reads 'CARCASSONNE.' One of these versions sold on eBay recently for $361.65, photo below. Carcassonne is a fortified medieval walled city in southwestern France. Carcassonne is essentially a castle that is also a city (La Cité de Carcassonne) around which the modern city, or 'Ville Basse,' grew.